But before and since then, I’ve been thinking out an idea I had. And when I say “thinking out” I mean “subtly obsessing over.” It’s been around the bend a lot for the last month. And it’s even turned into a concept and then a sort of thesis. But I still couldn’t get it straight – or out of my mind. 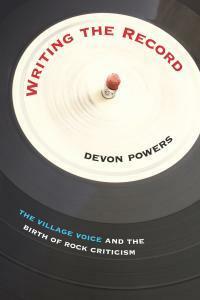 It seemed perfect that Eric Harvy‘s review of “Writing The Record: The Village Voice and the Birth Of Rock Criticism” would ultimately find me. I splurged and ordered the book special from the University of Massachusetts press. (And ironically enough, I am writing this from Cambridge, MA where my best friend/hetero-life-mate is graduating from Graduate School at Harvard this weekend.) Devon Powers’ book not only fuels my obsession with New York City and New York City publications (mainly New York Magazine) but it straightened out my concept. In many essays, homework assignments and ‘what-does-it-all-mean’ think pieces assigned to me over the years, I’ve spent my whole life trying to explain my overwhelming love for culture to everyone I know. Telling people that you’re personally offended when someone hasn’t seen a classic, or worse – your favorite – movie doesn’t really cut it (all the time.) You can only be as passionate as your friends will tolerate in conversation when you’re talking about the new Kanye West singles. (Why do people only call him Kanye these days?) They get sick of you dissecting GIRLS, the character arc of Adam Driver, the music direction on the show, and they also get sick of hearing about the plot of the novel you’re reading. (They also get sick of you laughing aloud to yourself when you’re only “reading” “online.”) All I know is, culture is all I’ve ever cared about. And “in this day and age” I’m pretty sure it’s all anyone cares about. (Note: I said “pretty sure.”) I thought radio would fulfill me, like it always had, but the corporation part started to swallow up my heart. Getting back to the basics and understanding why we do what we do is essential, no matter what your passion is. Every once and a while we ALL need to be reminded why we work where we work and do what we do. (And we also need to be reminded that you can walk away if you’re unhappy. I’ve done it and I’ve watched people I’m close to do it. It can be really hard and it’s “brave” or whatever but its the best lesson you can learn – for free. This essay idea I’ve been working on goes something like, “The New Indie Narrative.” I was trying to figure out, without entirely publicly attacking The Fork (but I guess I’ve already done that), a simple way to discuss how people talk about music. First and foremost there is so much to address in “the way people talk about music” that we might as well just hold a weekly seminar and call it a day. There isn’t a simple way to do it. Likely, if anything, it will be a few chapters long in the book I haven’t written yet. Powers helped me realize all of this. He even helped me realize that the whole concept itself was off. YES we (I) want to talk about how people talk about music, but it’s not about how it’s changed. The business of hip – and the hip press – hasn’t changed at all. It’s just the delivery method. There is no new narrative. The new boss IS the same as the old boss. The revolution WAS televised…but then it was canceled. Now it lives online. What we need to do is take an alternative look at the music press. Which among many things Powers discusses, was never really alternative. Or if it was it was only for the first year or so before everyone wanted to start making money. (I’m beginning to think that “being hip” only lasts the first 100 days – like Mick Jones said about Punk.) Powers explains commercialization of rock music (via venues and touring – for money – to propel rock’s story, we need money and we tour to make money, et al.) in the 1960s and how music coverage has always been a hype machine. That all sounds very familiar. Powers also touches upon the fact that Jann Wenner knew he could make money off of a music magazine and employed the business to do just that. Back in high school, I thought Rolling Stone was great. I followed it around for a long time. But that is also before I discovered college radio and before I discovered music that was released after 1975. Once I realized all this, I learned about Rolling Stone’s History Of Music and how it can plague the American “public”. Jann Wenner dropped out of UC Berkeley to start RS and to do something different, but the fact of the matter is, he’s always been “the man”. Yes, Wenner started the magazine as an alternative and as the first national music-centered magazine but they still sold ad space, just like the Village Voice, and they still had an agenda – the same way The Fork does now. Powers goes on later to discuss when Jon Landau used to write for Rolling Stone and then left and went on to manage – to this day – Bruce Springsteen (well, all that makes sense now.) “Some company freaks worked as critics before, after, or even during their jobs in publicity, and critics who left writing at times took jobs in the industry, as Rolling Stone’s Jon Landau famously did when he began to manage Bruce Springsteen.” It really is no wonder that Bruce tops lists and graces the cover constantly. Trying to make sense of the “social worth of popular entertainment” is what I’ve spent my last 24 years of life doing. Call me a culture hoarder or a “cultural worker” or…whatever you want. But I’m going to keep doing it. And I’m very grateful to have Powers iron out the folds in my brain the Internet has created lately/every day. And it’s sad to say that The Village Voice recently waded through some seriously bad news. Editors walked out on their jobs to protest the planned firing of staff columnists. And then those columnists were fired. And some other people are leaving The Voice too. So, after all, it really was a good time for me to quit my job to be a writer. Because I’m pretty sure the world’s “karma-failure” can’t hold me back right now. Hi to all, how is the whole thing, I think every one is getting more from this web site, and your views are good in support of new users.